We believe our exceptional staff is the reason Planet Kids is so successful. Although programming and location are important, it is a special counsellor that children will remember most from their camp experience. Planet Kids staff are well screened before being considered for employment, a process that includes an application and/or resume, participation in an interview, and provision of a Police Reference Check. We budget approximately $35,000 per year on an extensive 40-hour staff training program, which includes first aid and CPR certification, sensitivity training, emergency care, program planning, behaviour management and more. We are very proud of our high staff return rate of nearly 70% compared to the industry average of 45%. 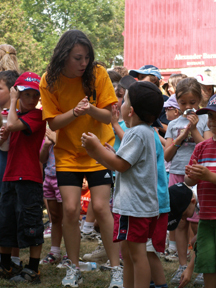 We value our staff and their sincere dedication to making every child’s camp experience the best it can be. At Planet Kids, "our staff makes the difference!" How Do We Prepare our Staff?